West Virginia Gov. Jim Justice needs help to win reelection, and two of Trump’s top political hands are stepping up. With the president by his side, West Virginia Gov. 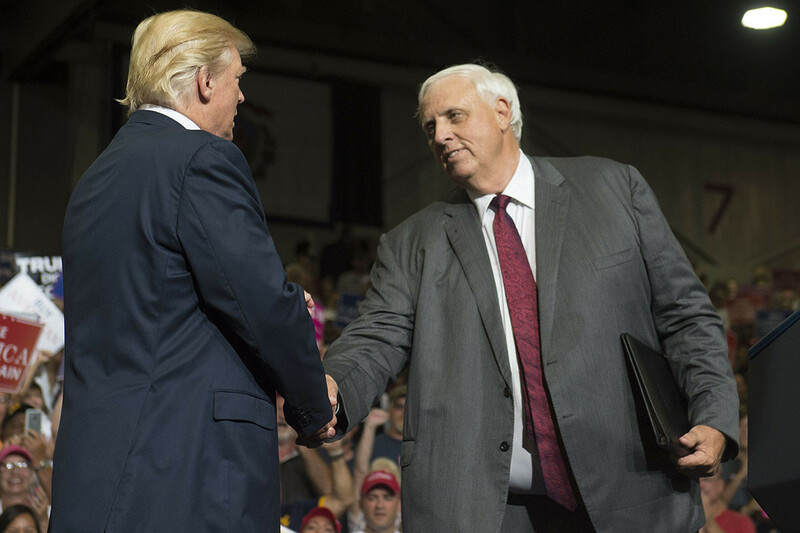 Jim Justice made a dramatic announcement before a raucous crowd of “MAGA”-hat wearing supporters: He was bolting a Democratic Party that had “walked away” from him to join Donald Trump’s GOP. Two years later, Trump is now repaying the favor. A pair of the president’s top lieutenants, Bill Stepien and Justin Clark, are joining Justice’s campaign as advisers as the governor tries to navigate a treacherous 2020 reelection bid. The move illustrates how Republicans up and down the ballot are hitching themselves to Trump’s ever-expanding and newly professionalized 2020 political machine. With the president lining up a team of experienced political strategists, deploying an ambitious national field program, and exercising nearly universal control over the party apparatus, Republicans are eager to exploit his organization for their own benefit. But Justice may be going the furthest. Stepien and Clark are two of Trump’s most loyal political aides: Both worked on his 2016 bid before going on to serve in the White House. They recently joined the president’s 2020 campaign, where they are overseeing an aggressive effort to ensure that anti-Trump activists don’t overtake next summer’s convention. Justice has long been a top priority for the administration. Before announcing his August 2017 party switch, the 67-year-old coal mining executive went hunting with Donald Trump Jr. and met with the president several times in the White House. Last year, Trump — who has taken to calling the six-and-a-half-foot governor “Big Jim” — traveled to The Greenbrier, a luxury resort owned by Justice, to headline a pre-July 4th event for military personnel and veterans. And when Trump campaigned in West Virginia ahead of the 2018 midterms, he was frequently joined by Justice. The White House is determined to save the governor from the fate of other party-switchers like the late Pennsylvania Sen. Arlen Specter, who lost a primary after switching to the Democratic Party during Barack Obama’s first term. Switching parties has long been a risky endeavor for politicians, who face the dual challenge of winning over wary voters in their new camp while alienating those in their abandoned party. Dearborn added that Stepien and Clark’s deep understanding of Trump-world, and their longstanding connection to the president, makes the two uniquely suited for a Democrat-turned-Republican governor running for reelection in a state where Trump is popular. It allows him “to send a message that, ‘Hey not only did I switch parties, but I’m loyal to the president. I’ve got two of his top lieutenants helping me on my campaign,’” Dearborn said. Justice is under mounting political pressure as he kicks off his reelection campaign. The governor is trying to fend off a rebellion from conservatives who view him with suspicion given his past Democratic Party affiliation. Several local GOP organizations have approved resolutions expressing “no confidence” in him. At the same time, he’s facing questions surrounding his personal conduct. On Tuesday, Forbes published an investigation into Justice’s financial history which detailed how he’d failed to pay taxes on a plethora of businesses he owns. The Department of Justice, meanwhile, has launched an investigation into some of Justice’s companies. Senior Republicans in the state are increasingly convinced that he will face a serious 2020 fight, possibly in both the primary and general elections. Among those weighing a bid is Democratic Sen. Joe Manchin, a former Justice supporter who has since become a sharp critic. Manchin previously served as West Virginia governor and said he loved the job. Many believe Justice’s fate hinges on Trump, who won West Virginia by 42 percentage points in 2016. The president’s involvement in the race could help solidify the governor’s standing with conservative voters who aren’t yet sold on him. As the new election cycle kicks into gear, Justice isn’t the only Republican leaning on the Trump machine. Mississippi Lt. Gov. Tate Reeves, a favorite of the president’s inner circle who is running for governor, has met with multiple Trump aides in recent weeks, including White House Political Director Brian Jack and several members of the reelection campaign. The discussions come as Reeves tries to extinguish primary challenges from several Republicans. The lieutenant governor said the president’s organization in the state is “key to victory in November.” Trump carried Mississippi by 17 points in 2016. Kentucky Gov. Matt Bevin, facing his own reelection this year, has been speaking regularly with the president. And Bevin’s team has been coordinating with the Republican National Committee, which has melded its operations with the Trump campaign. Vice President Mike Pence, meanwhile, recently headlined a fundraiser for Georgia Sen. David Perdue and campaigned with South Carolina Sen. Lindsey Graham. GOP officials working on Trump’s 2020 blueprint say they’re assembling an infrastructure that will extend far beyond the presidential race. Mike Reed, an RNC spokesman, said the joint RNC-Trump campaign field program will engage in voter registration and turnout effort to help Republicans at all levels. Stepien and Clark, through their newly-launched firm, National Public Affairs, will be serving as advisers on the Justice campaign and remain a part of the Trump reelection effort. Trump aides said it hasn’t been decided what precisely Trump will do in the race. But there’s no question the governor would welcome Trump to the state whenever he can make it.